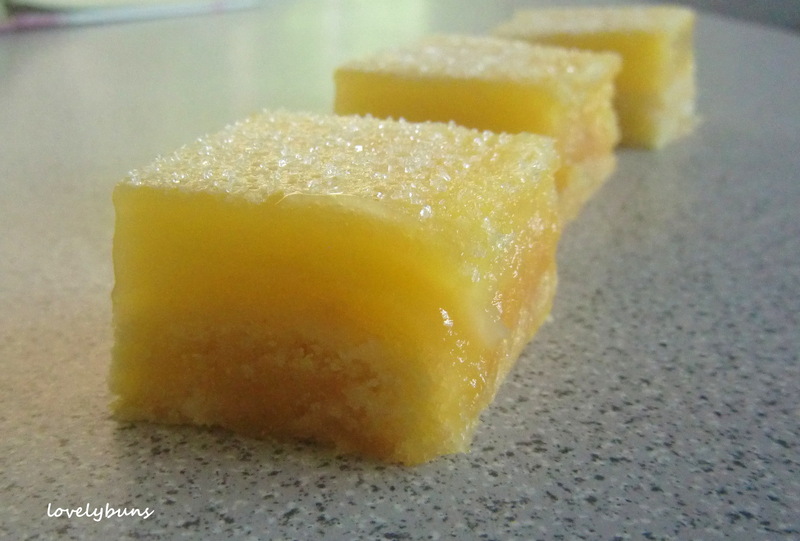 These are lovely summery lemon bars – a bit like a thick layer of lemon curd on top of shortbread! 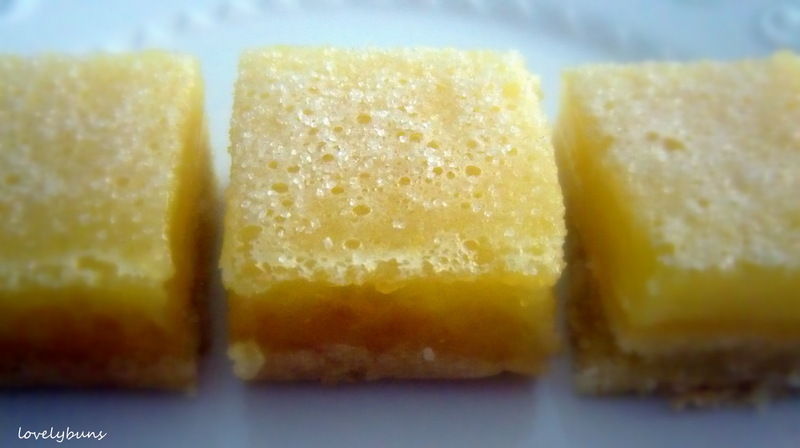 Made with the juice of 4 lemons and the zest of 3 they are really lemony! Topped with a sprinkling of caster sugar, delicious! * I just put some normal rice in the blender/grinder and ground until it was the texture of granulated sugar. ** If you find this too lemony, the next time just use less lemon juice and make up to 200ml with water. How to: Make the base -Prepare the tin, it’s best to use a baking tin which is at least 5cm deep and line it with grease proof paper as this stops the topping running when first poured over the base. My tin was about 21cm square. Whiz (or rub together) the flour, rice, butter and sugar for the base. Add the milk and stir together with a knife, then use your hands to mould it together to form a dough. Put the dough in the tin and press down evenly. Bake at 180°c for 20 mins until golden. If the dough starts to puff up during baking, puncture it a few times with a fork. When golden, remove from the oven. Make the top – Mix the lemon juice and eggs together. Then pour into a bowl containing the flour, sugar and zest. Whisk until well blended and then pour over the still warm base. Return to the oven for 15 mins until the top is just set. Remove from the oven and check that a cocktail stick poked into the cake comes out clean. Finally dust with caster sugar and leave until cold before cutting into squares or bars of any size. Tiny bite sized squares are good for feeding large numbers and larger bars are delicious served as dessert with some greek yoghurt. These look beautiful, firm and lemony!! thanks for the post. 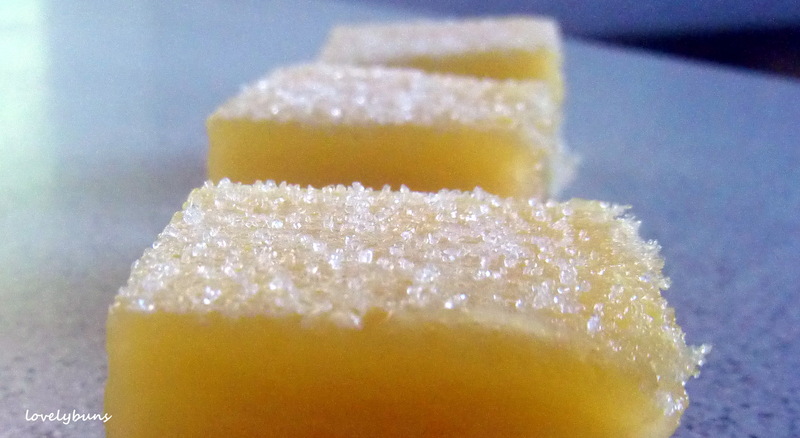 Your lemon bars look utterly delicious & well flavoured too! Ooh these look delicious! I’ll have to try your recipe. Thanks for the great posts and lovely blog! Oh my!! YUM! I must try this recipe! Thanks for sharing! J’ai vu dans ta présentation que tu a habitée en Alsace, parle tu français ? Tes recettes me font terriblement envie (surtout ce petit biscuit au citron) aurais tu un blog en français ? I’ve always been a big fan of lemon bars! These look great!